Luxury amenities and postcard views of Boston are helping attract some high rollers to 45 Province Street near Downtown Crossing. A two-year boom in residential real estate construction — focused almost exclusively on luxury homes for wealthy renters — is about to test the limits of Boston’s demand for ultra- high-priced apartment living. More than 8,000 units are expected to be built in the city during the next three years. The unprecedented burst of construction will double the supply of units built in large, luxury complexes since 1960, according to the real estate firm JLL. The new buildings feature everything from yoga lounges to swank roof decks, and their apartments come at a hefty price. At Avalon Exeter, a tower rising in the Back Bay, one-bedroom units with 800 square feet start at $4,000 a month. At the recently completed 315 on A Street in South Boston, slightly smaller apartments are available for $3,700. Live there with your pet and the rent can go up another $100 per month. The sudden construction boom is driven by several factors. Boston’s population increased 3.1 percent, to more than 636,000, between 2010 and late 2012, but hardly any new apartments were built during that period due to lingering weakness in the economy. An existing imbalance between supply and demand grew wider and caused average rents to jump about 20 percent, according to JLL. That made new towers even more attractive to investors. In downtown alone, a dozen large apartment buildings are under construction. Apartments were also a popular development choice because lenders considered them less risky following the nation’s housing collapse. Now, as the market recovers, condominium buildings are also being built, adding to the development pipeline. Given Boston’s limited supply of modern rentals — nearly half the city’s apartments pre-date World War II — Begelfer and most other real estate specialists believe the apartments under construction will be filled before long. Still, even aggressive investors, such as the development firm Gerding Edlen, are recalibrating their approach as the first wave of units begins to reach the market. “There’s only so many times you can be successful being the most expensive building in town,” said Kelly Saito, president of the Portland, Ore.-based company, which is also building projects in Chicago and San Francisco. The company completed the 315 on A tower last year and is now part of a team constructing a 378-unit complex in the South End. But now the firm is planning to construct its next building on the less developed — and more affordable — East Boston waterfront. “We’re thinking about unique locations, timing, and how can we deliver these for a price other than the new high- water mark,” Saito said. But he said rents there will not offer a deep discount from the downtown luxury market. Those units may be offered for $200 to $400 a month less, said Saito. Despite high demand for moderately priced homes in Boston, it is hard to build them due to high land prices and ever-rising construction costs. Builders also must charge rents that will achieve profits promised to investors. A few developers have been able to produce lower-cost housing by developing projects in neighborhoods outside downtown. For example, Mount Vernon Co. quickly filled a 500-unit complex in Allston called the Green District, where one-bedroom units rent for about $2,100 a month. The company’s chairman, Bruce Percelay, is among those skeptical that developers building downtown are going to find enough tenants to pay luxury rents. Some of the early entrants to the market are already offering concessions. 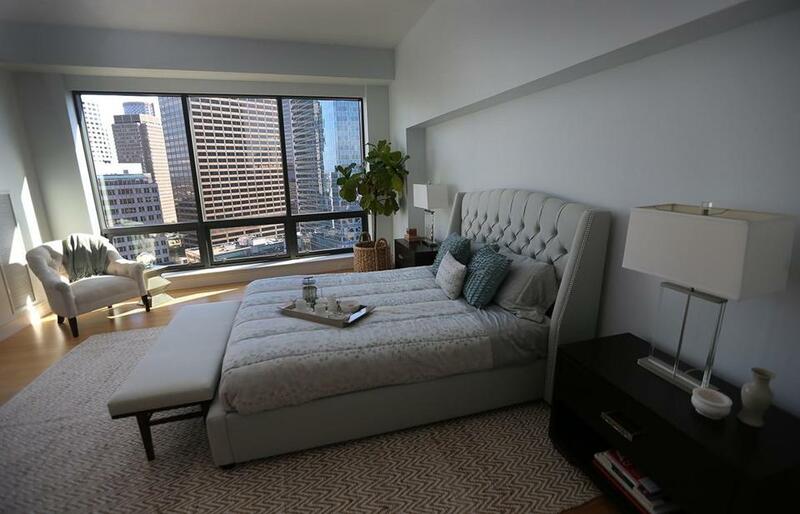 At the Kensington, a 381-unit apartment tower on Washington Street in downtown Boston, project executives are offering incentives that include two months’ free rent on a 24-month lease and reduced broker fees. Even with those incentives, the rents aren’t cheap. A 578-square-foot one bedroom in the complex still costs about $2,700 a month, according to a recent advertisement distributed to brokers. About 61 percent of the building’s units have been leased to date, a spokeswoman for the project said. The competition for luxury renters will probably become even tougher over the next few years. About 1,250 units are expected to hit the market this year, followed by more than 3,100 others next year and another 3,660 in 2016. Together, the supply in those three years will more than double the number of units built in large buildings since 1960. Hynes, the Boston Global Investors executive, said the flurry of activity will not undermine his plans to start construction this June on another 850-unit complex of apartments in the South Boston Innovation District. If anything, he said, the development of residential buildings such as 315 on A and a tower rising at Pier 4 will only strengthen the area’s appeal. He expects there will be plenty of demand for more apartments by the time his building opens in 2017.